Colors– Bring swatches, throw pillows, paint chips, etc. for color matching. Room size and rug size needed– Measure first. Click here for handy rug size guide. Rug Design– Center medallion, allover pattern, solid, boreded etc. 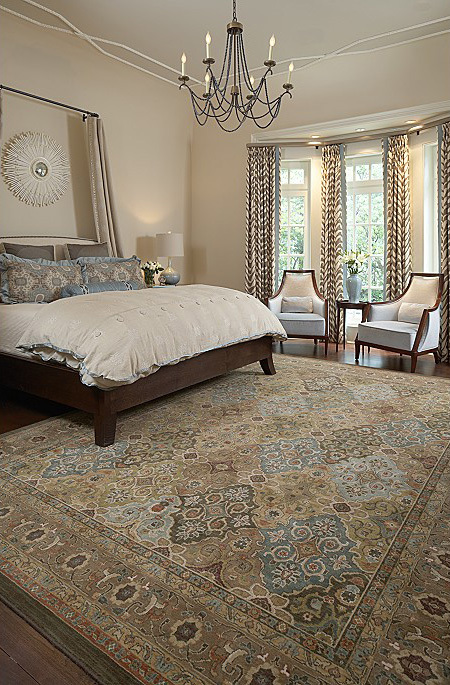 Type of rug– Hand knotted, machine made, hand tufted, flat weave, hooked, etc. What rug for what room– Be sure to take into consideration factors such as high traffic areas, bathrooms or barefoot areas where texture will matter. Thickness of rug– Will doors have to clear the rug? Budget– Have a plan for how much you want to spend. Season– Are you decorating for a particular season, theme or atmosphere? Believe it or not hand-made Oriental rugs fall into the category of art work. Unlike paintings and sculpture, Oriental rugs can be used throughout their lifetime and can represent one of the best investments you can make. They can be enjoyed as an art form, useful in their utility as a floor covering and could represent an investment that may appreciate in value over time. They can also be passed down from generation to generation as it is not uncommon to find rugs over 100 years old that remain in usable condition. At 50 years an Oriental rug is considered semi-antique. At 100 years an Oriental rug is considered an antique. It must be made of natural fibers. (Wool, cotton or silk). It must be woven completely by hand. It must be of Asiatic origin such as Iran, India, China, Pakistan, Turkey, Afghanistan, Russia, Tibet, Nepal; hence the term, “Oriental rug”. Machine made Oriental design rugs lack at least one of these requirements and usually only last up to about 15-20 years. Where-as a high quality hand made rug can last 3 or 4 generations. An Oriental rug may be genuine and still not be of fine quality. The quality of an Oriental rug is dependent upon the use of the finest wools, the truest of color-fast dyes, and the most skillful hand-weaving techniques. Consistent weave; are there flaws in the weave? You may want to look on the back side of the rug to detect excessive irregular weaving. The rug should lie smoothly on the floor; does it ripple, pucker or wrinkle? Consistent dyes; is the dye colorfast? Compare the colors on the front and back of the rug to determine if the rug has faded. Straight edges and ends; the selvedges or the sides of the rug should be straight and properly secured. Width dimensions should be the same at both ends. Well finished ends; is the fringe straight and neatly cut? Rugs with-out fringe should have ends that are finished in a neat and secure manner. Knot count- Different countries, regions, villages and tribes weave their rugs using different knot densities; therefore consider buying the finest in each type. Click here to read our article “You can count the knots although knots don’t count”.